"a love story which emerged quickly in the final act and served as the deus ex machina which saved the day"
As the Oracle could said: "Cute, but not so smart". It was obvios the Trinity was in love of him and she was trying not to tell. 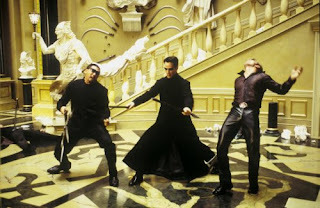 In the first Matrix every action escene meaned a step forward in the development of Neo, in the rest of the movies were meaningless; a lot of fun, but meaningless. The meaning of The One: that could have been a good theme for the movie: to cuestion the freedom we supose to have. But they don´t dig it, its just something fancy to say. One of the things I hated more is that Neo is as clueless as in the first movie. He is suposed to be a mesias, aware about himself in this movie, but again they prefer to repeat the formula of the firts movie. I was expecting a Last Temptation kind of evolutión in the character. There was a lot of oportunities to do analogies betwen Neo and other mesias: to turn water into wine in the restoran with the morevingio, to liberate human from the agents and to throw them into a pig's bodie, etc. As I said going out of the movie: to much coke and to little imaginatión.